One of the most ambitious building experiments in history is nearing its end in many former Soviet states. Faced with severe housing shortages in the 1950s due to rapid population growth and urbanization, Soviet planners rolled out their first pre-fabricated, concrete panelled apartment buildings. By industrializing the building process, instead of using time-intensive masonry, housing stock throughout the Soviet block was rapidly expanded in the 1960s with these so-called Krushchyovkas, named after Soviet leader (1953-1964) Nikita Khrushchev. Between 1961 and 1968, no fewer than 64,000 Krushchyovkas were built in Moscow alone, in addition to many thousands in other parts of the Soviet Union and in satellite states, like Bulgaria, Hungary, Poland, and East Germany. Krushchyovkas typically included one-room (30 m2/323 sq ft), two-room (44 m2/474 sq ft) and three-room (60 m2/646 sq ft) apartments. Because elevators were a substantial expense, Krushchyovkas only had stairways and a maximum of five floors. With their low ceilings, small rooms, and terrible insulation, these cheap apartment blocks did not offer much in terms of comfort. Yet they were often the first apartments for workers and farmers moving from the countryside to urban areas. Originally treated as temporary shelter until the housing shortage could be alleviated, many Krushchyovkas have now fallen into disrepair or are beyond their original shelf-life of twenty-five to fifty years. In February 2017, Moscow mayor Sergey Sobyanin announced a plan to demolish 8,000 Soviet-era housing blocks – 10% of the city’s housing stock – affecting 1.6 million Moscovites who will have to be rehoused in the years to come. Sobyanin’s plans were met with fierce resistance by residents and housing advocates who challenged the mayor’s claim that they are “still living uncomfortably in ancient housing,” as the BBC reported. In fact, many people continue to live in Khrushchyovkas quite comfortably today. 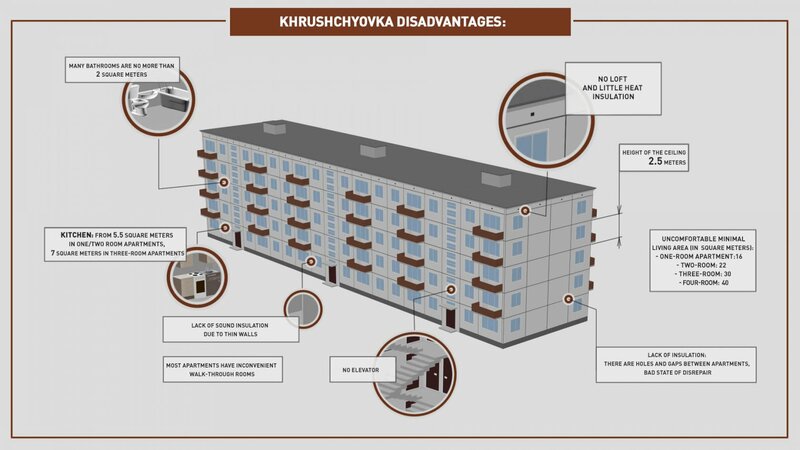 Some disadvantages of the ageing Krushchyovka buildings (Image source: Russia Beyond). Countries have differed in their approach to deciding whether to demolish or renovate the housing blocks. In Ukraine, the Kyiv government has announced plans to launch pilot projects to relocate Krushchyovka residents to new housing and replace the old buildings with new, commercially appealing high-rises. Other former Soviet republics and satellite states prefer renovation over demolition. As part of a smart cities project, Krushchyovkas in Estonia’s second city Tartu will be renovated into near-zero energy buildings, with European Union funds. In East Germany, following the reunification, thousands of Soviet-era apartment buildings were successfully renovated, extending the life of these structures and dramatically improving their energy efficiency. A critical factor in these success stories was that building residents were tenants rather than owners, in contrast to many parts of the former Soviet Union where social housing was privatized after Communism collapsed. Moving forward, it appears that such private ownership will be a critical factor in determining the fate of Eastern Europe’s remaining Krushchyovkas.